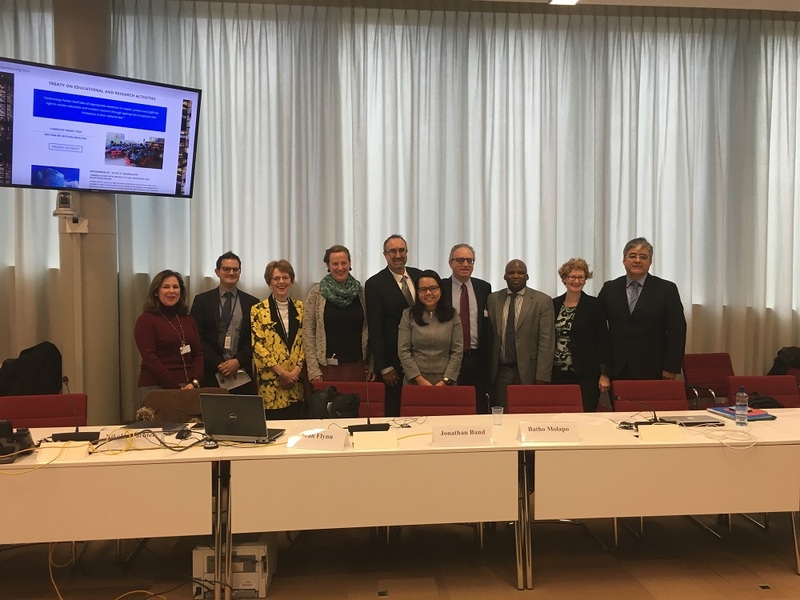 The side event took place in the context of the WIPO Standing Committee on Copyright and Related Rights (SCCR), which met from 26-30 November, and included substantive agenda items on limitations and exceptions. The side event entitled, “Advancing Text-Based Deliberations on Limitations and Exceptions: The Treaties on Education and Research Activities (TERA) and Libraries, Archives and Museums (TLAM),” was organised by the American University Washington College of Law, and was moderated by Luis Villaroel of Innovarte, Chile. Prof. Sean Flynn of the American University Program on Information Justice and Intellectual Property presented the Civil Society Proposed Treaty on Copyright Exceptions and Limitations for Educational and Research Activities (TERA), underlining the purpose of providing a model instrument able to reflect the work that has been done and the existent proposals all in one. According to Flynn, these aims can be reached in four ways: protecting limitations and exceptions from the three-step test, requiring specific exceptions, promoting balance in copyright systems and safeguarding cross border uses. “This is not a radical document; it is an achievable one. It is not intended to be final, but rather is a starting point for the next phase. It could be used in the regional seminars to adopt declarations or statements or purpose and adapted into a model law or other form. We offer our assistance to countries that want that move if further, including by tabling it in this committee for further consideration,” Flynn told the audience. Jonathan Band of the Policy Bandwidth and Georgetown University in Washington, DC discussed principles for a treaty on Copyright Exceptions and Limitation for Libraries, Archives and Museums (or LAMs, as he called them). “We are shooting at something in the middle, in many ways we were inspired by the Marrakesh Treaty. The aim is to come up with an instrument which countries can adopt to facilitate the mission of LAMs,” Band explained. The operative provisions are reflected in some principles which were handed out to meeting participants. In particular, there is a specific list of activities which need to be protected, such as preserving, advancing research by providing copies to researchers, lending works to users, translating, and making accessible copies for people with disabilities. Batho Molapo of the Embassy of South Africa welcomed the information which came up from the studies and underlined the fact that most of the three objectives important for the African perspective – inquiry of the reasons, identification of the gaps and harmonisation – have already been done. Priscilla Ann Yap from the Mission of Malaysia closed her statement on the importance of keeping the conversation going at all levels. “We are fully supportive of the idea of using the regionals to advance work on the SCCR because we would have a regional perspective and we could build more awareness among the regional stakeholders” she said. Rina Pantalony of the International Council of Museums used the example of the disastrous recent burning of 90 percent of the collection of National Museum in Rio de Janeiro to highlight the importance of conservation of information. Jean Dryden of International Council of Archives (ICA) gave some tricks to a better understanding of the work of archives. “We also need an exception to make the millions of orphan works in our holdings available for research and cross-border issues demand an international solution,” said Dryden. “Licensing is not the answer. Archives need exceptions, exceptions that pose very little risk to rights holders due to the nature of archival material,” she stated. "Towards WIPO Regional Seminars On Copyright Exceptions: Looking Out For Users" by Intellectual Property Watch is licensed under a Creative Commons Attribution-NonCommercial-ShareAlike 4.0 International License.